Home Flower Care	Classic Bride + FiftyFlowers = Demijohn Vase Centerpieces with Pretty Peonies! 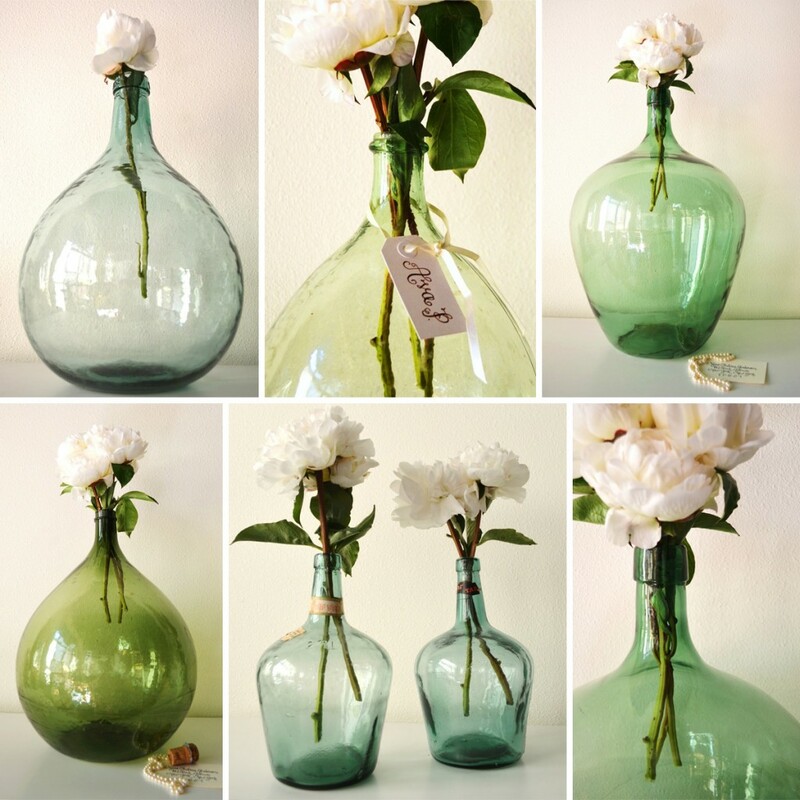 Classic Bride + FiftyFlowers = Demijohn Vase Centerpieces with Pretty Peonies! Bad News… This is the last DIY project from our Floral How-To Week with Sarah, of Classic Bride Blog. Good News… You can still get 20% OFF anything in her online shop, CB Vintage, until the end of July (that’s 9 more days)! Just mention FiftyFlowers! Sarah spent a week featuring a lot of awesome and easy DIY Flower projects on her preppy wedding blog. Projects that included a beautiful DIY peony bouquet, several easy centerpiece ideas and a fabulous flowering display, and all used stunning white peonies and a gorgeous green filler pack from FiftyFlowers.com. Today’s project features some of my favorite vases (and apparently Sarah’s too! )… European Demijohn Vases. These vases were popular for holding wine in France, Italy, and Germany. They are usually rounded at the bottom with a narrow neck (kinda like an upside down balloon) and are usually greenish in hue. With the narrow necks, these vases are like big bud vases, as they will only hold a few stems…but they still make a stunning statement piece! Place a Demijohn or two at the Welcome Table or on your Ceremony Alter, then Fill with a few stems of a fab Focal Flower, like Peonies, Garden Roses or Hydrangeas, to create a Classic and Elegant Wedding Arrangement. After the Wedding, use the Demijohn in your home decor for a beautiful reminder of that special day! See how Sarah would use these special vases on the Classic Bride Blog! And remember, you can purchase these beautiful Demijohn vases along with lots of other great vases, vessels, antique props and vintage wedding decor, in her online shop, CB Vintage. Plus, mention FiftyFlowers in your email to her and get 20% OFF every item in her shop until the end of July!! Email theclassicbride@gmail.com now! Need Fresh Flowers to fill these Gorgeous Vases? Head to FiftyFlowers and check out some great focal flower options, such as Peonies, Garden Roses or Hydrangeas.